When is a worker an employee? The IRS and state tax authorities are targeting the workforce that is incorrectly being classified as “1099 contractors” when in fact they are employees. Why Are They Cracking Down? The loss to tax authorities by treating legitimate employees as 1099 contractors is substantial. The employer is avoiding withholdings for workers’ comp premium, income tax, social security and Medicare. But the big reason? So the employers who are incorrectly paying “employees under 1099” face serious fines, interest, back taxes and penalties. 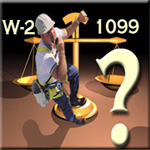 When is a Worker a W-2 Employee vs. a 1099 Contractor? Employers should be wary. Under a recent initiative from the White House, the IRS is taking a dim view of incorrectly classified employees. For the record, there is no such thing as a “1099 Employee.” It’s W-2 employee or independent contractor. 1. Does the business provide instructions to the worker about when, where and how he or she is to perform the work? 2. Does the business provide training to the worker? 3. Are the services provided by the worker integrated into the business’ operations? 4. Must the services be rendered personally by the worker? 5. Does the business hire, supervise and pay assistants to the worker? 6. Is there a continuing relationship between the business and the worker? 7. Does the business set the work hours and schedule? 8. Does the worker devote substantially full time to the work of the business? 9. Is the work performed on the business’ premises? 10. Is the worker required to perform the services in an order or sequence set by the business? 11. Is the worker required to submit oral or written reports to the business? 12. Is the worker paid by the hour, week or month? 13. Does the business have the right to discharge the worker at will? 14. Can the worker terminate his or her relationship with the business any time he or she wishes without incurring liability to the business? 15. Does the business pay the traveling expenses of the worker? 16. Does the worker furnish significant tools, materials and equipment? 17. Does the worker have a significant investment in the facilities? 18. Can the worker realize a profit or loss as a result of his or her services? 19. Does the worker provide services for more than one firm at a time? 20. Does the worker make his or her services available to the general public? PrevWhy Pay as You Go?